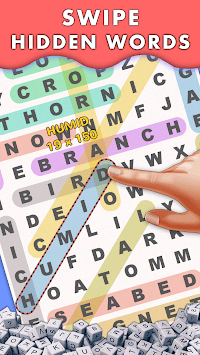 Play word search in hundreds of progressively challenging yet interesting levels. Board size is smaller in initial levels and as your skill improves it gets bigger. Each Pack is based on a topic, it has several hundreds of popular words with unlimited levels to play. Levels are scored with star rating supporting full social gaming features to compete with your friends and others online. Swipe over the characters in the board to form words shown above it. Find all the words in the list to complete the level. Faster you find words higher the score and ranking. Learn Words with meaning - Shows the meaning of the words after each level completion. Complete 25 engaging achievements and compete in online leader boards. 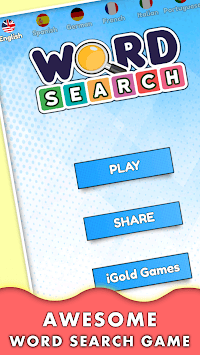 Awesome Word search game with scores, ranking and Social features. Choose your game board theme from three choices. Form bonus words in give time for bonus scores. Challenge your skills in 4 difficulty modes in several packs. Play offline or compete online with thousands of players around the world. Supported English, Spanish, French, German, Italian & Portuguese. 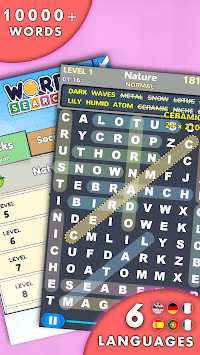 Amazing word finding game, search words in your favourite topic.